An advanced flow battery system has been established at Randolph-Macon College in Ashland, Virginia. The system is from ViZn Energy Systems. ViZn is based in Kalispell, Montana, and makes energy storage solutions. 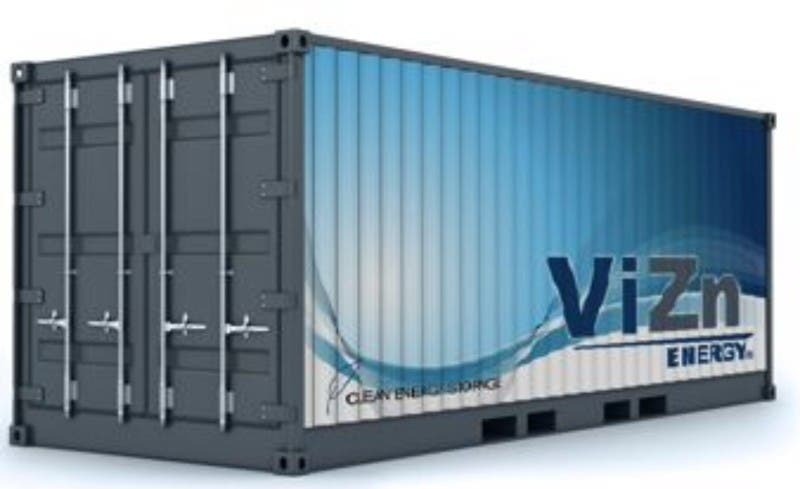 In particular, the company manufactures microgrid-scale non-acid Zinc/Iron chemistry flow batteries — we covered ViZn through an exclusive scoop/interview when it was unstealthing (prior to a name change). One of its main products is a 80kW/160kWh battery system protected by a 20-foot-long shipping container. The other is five 1MW battery systems combined, each in its own 20 foot shipping container, which reaches 3 MWh. Some of the benefits of using ViZn’s energy storage systems are frequency regulation, load shifting, renewables firming, and arbitrage. The ViZn flow battery uses a water-based flow system with an iron redox counter electrode and a zinc electrode. At Randolph-Macon, the newly installed system is for testing utility and renewable energy compatibility. In this case, it is solar power from a company named Dominion Resources, one of the largest energy-producing companies in America. “We are thrilled to work with Dominion and Randolph-Macon College to have our zinc-iron redox battery as one of the two battery technologies included in the project to assess battery performance for both power and energy services,” said Ron Van Dell, president and CEO of ViZn Energy Systems. One big criticism aimed at solar power has been that it is only available during daylight hours under certain conditions and at favorable times. However, energy storage solutions are solving that problem by allowing solar power installations to generate electricity that is stored, so it can be used later. Currently, these energy storage systems may not be very large, but they are in the early stages of development and can expand to parallel growth in the solar industry. In other words, as they demonstrate their effectiveness, demand and investment should follow. Flow batteries have some advantages such as safety and longevity. If you say the words “flow battery” to someone, she or he may draw a blank because lithium-ion batteries are much more common. However, flow batteries have proven very useful in some commercial situations and have some definite advantages. Randolph-Macon is a private, liberal arts and sciences college.